Chasing Thunderclap haven’t had the best of luck when it comes to their band. 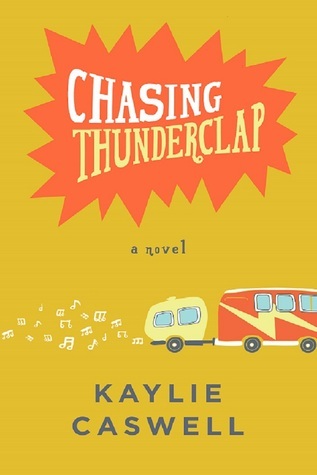 With the death of a former band mate and on the edge of losing their new lead guitar player to an Ivy League college, could Chasing Thunderclap be no more by the end of summer? Hell-bent on keeping Bryan, their lead guitarist, in the band, the remaining members will do anything to turn his mind away from college. But as their plans crumbles away, each member begins to question whether this dream is worth following? I’m not going to lie: I hated this book for the first 75% of this book. The behaviour of these boys actually disgusted me and they were so irritating. But I had to give the Caswell some props for making some distinction between the boys. I literally thought I was going to be stuck with five POVs with no idea who was speaking when. But the story of each boy was clear and different, and when weaved together, the novel was enjoyable to an extent. I liked the storyline but hated the characters. Haha, is that even possible? I really liked how the band had different meanings to each member. And how important the band was to their fans and that fuelled the boys to keep going. There’s a scene where a fan comes up to Bryan and tells him how their music saved their life, and that scene was so cute! I was actually going to not even finish this book but I’m glad I kept reading because the ending was good. I don’t say that often but I liked how realistic it was. And it was good to see each boy finally decide what their position was in the band, and I agreed with each decision they made.